After a glimmer of hope that the spring sports season would get off to a relatively normal start this year, the roughly eight inches dropped on the area Thursday have dealt teams a cold reality - the games will have to wait, again. It was a busy Thursday morning for activities director Brian Paulson in his Rhinelander High School office. By the time he was done, all of RHS sporting events for Thursday, Friday and Saturday were canceled - and a couple of events for next week had gone by the boards. "It's been different," Paulson told the River News Thursday afternoon. "I looked out my back window (Thursday morning) and I saw the track completely empty and the field at Mike Webster Stadium. I was excited to see that, but now of course we've got some snow here. Hopefully this can melt a little quicker." The good news about last year's Tax Day storm is that it was followed by a significant warming trend that had fields in the area ready to play in less than two weeks. The same moderation is not expected this time around. The temperature is not supposed to rebound back to the 40s until tomorrow, and the mercury is not forecasted to hit 50 until Tuesday. For the teams stuck indoors as a result, the melt cannot come soon enough. "It's the cards that we're dealt and we're doing the best we can," said RHS softball coach D.J. DeMeyer. "The girls are getting frustrated. I'm getting frustrated." Most of the non-conference games for late week have been canceled, with no plan to be rescheduled. The lone exception was a girls' soccer game scheduled for yesterday between Rhinelander and Wausau East that has been moved to April 29, though Paulson said that date may move again should either school need to clear its calendar for a conference make-up game. Antigo moved its boys' tennis dual against Rhinelander to April 22 and the two schools have already canceled the baseball game scheduled to be played Tuesday in Antigo. The schools hope to play a doubleheader on Thursday, but that will likely need to be played at a neutral site. "It will be more of a Monday or Tuesday call," Paulson said. "We know Medford's playing at Mosinee, so that field should be open. We've got an option there. I think West plays at Everest and I think East plays somewhere, too. We've done a little research but we haven't made any phone calls because we feel like we'd be spinning our wheels." Some sports have been luckier than others in regard to the weather, but each RHS spring sport has now been affected with at least one cancellation. The RHS baseball, girls' soccer and boys' tennis teams have been able to get outside. 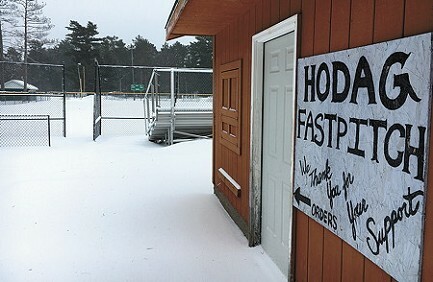 That hasn't been the case for Hodag softball, which has seen each of its first eight games nixed due to weather. It could possibly be an 0 for 9 start if Wausau West is not ready to host the Hodags come Tuesday. "It's hard. I guess that's the best word," DeMeyer said. "It's depressing. The girls, we've had some of our best practices the last couple practices, so I give them credit. It's hard to do the same thing over and over without getting to see your gains on the field." When the snow finally abates, teams will once again be left with a short sprint to the finish line. If softball, for instance, plays Tuesday, it will play its first game exactly one month before the start of the WIAA tournament. DeMeyer said, after what his team went through last year, he's concerned about the rigors of a condensed schedule. "We can't be playing six games a week. It's not healthy," he said. "Doubleheaders took a toll on us last year and they'd take a toll on us this year, because we only have 13, 14 girls. That's a lot of games. Injuries play into that when you start playing doubleheaders and I'm not willing to put my girls through that." Rhinelander is in the process of researching some out-of-the box ideas to extend the spring season should the Northwoods be dealt with late thaws again. Back in January Dr. Lee Swank, through the Hodag Schools Foundation, presented the district with a $500,000 donation to be used toward the construction of some sort of indoor practice facility that could help alleviate the situation. "With Rhinelander's unpredictable spring weather, an indoor facility here would help teams get off to a great start," Swank noted in an HSF press release at the time of the donation. "In addition, this kind of facility could be an asset to the community, helping draw new families to the area and providing a space for senior citizens and the community to use year-round due to the inclement weather during the winter." 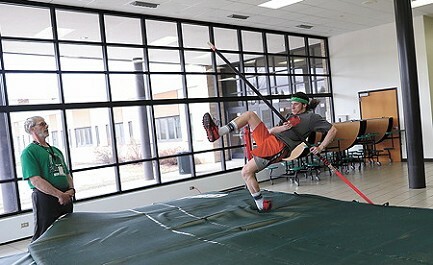 Since then, Paulson said he and other school and HSF officials have toured some temporary dome structures in Minnesota and will be looking at permanent steel structures in the near future in the southern part of the state - like multi-purpose indoor facility's constructed in Kimberly, Kaukauna and Sussex Hamilton. "We're trying to determine what we can do financially and what's the best options for the kids," Paulson said. "We're looking at both situations and making sure we're doing our research." Count DeMeyer among those who would love to have some sort of indoor solution. "I'd love to see if we could get something like that up here, but it would have to be a full school, community, business (effort) to get something like that," he said. "It would definitely benefit the community if we could get something like that. Until that happens, this is what we have to deal with."